A handy accessory to replace the lower eyelets down at the dropouts. 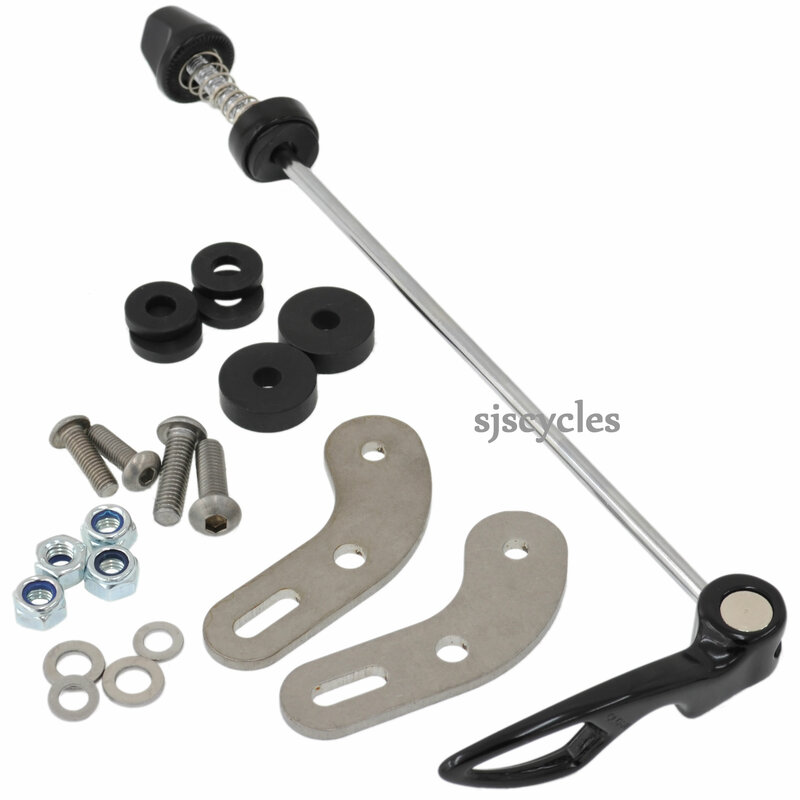 With this set you can convert your racing bike or your MTB into a touring bike ! I bought it trusting that it would serve on bicycle 29 ". A little expensive but held the rack perfectly for 3 days ride to Paris. It's heavy, won't fit Tubus Luna (require drilling), bolts too long, won't fit some frames with fence around dropout (ie Ritchey), slips even QR tightened thus unsafe and could cause injury or death. Very useful for attaching a rack to a bike that should never have one fitted. A bit fiddly to put on, and it makes taking the wheel off harder, but way better than a rucksack. The skewer supplied with the kit is approx 200mm long. The total width that I need to clamp is 130mm dropout gap plus approx 23mm for dropouts and adapter plates making a total of 153mm . There is not enough thread on the skewer to lock it up and I would prefer not to use the plastic spacers / washers to make up the gap as metal to metal clamping effect is better and spacers are too easy to loose / drop while changing wheel . Do you supply a shorter skewer that would do the job securely. Will It Fit With Disk Brakes ? Regarding this adapter, can you tell me if it has enough clearence for rear wheels with disk brakes ? I'm worried about the caliper. And also, is this for especific carriers or is it universal ? This is a universal kit so it can be used with most standard racks. Due the nature of the kit it can be adapted to fit most bikes and could be adapted to work with disc brakes but almost every bike has slightly different disc brake mountings so we would not be able to say for definite that this kit would work with your bike and disc brakes.